Intrapreneurs suggest new directions that clash against corporate machinery, and corporate roadblocks can be difficult for one person (the intrapreneur) to overcome. Volunteering to mentor incoming employees results in grateful line managers (who are often too busy to spend time with new hires) but also allows the intrapreneur to progress their idea by assigning innovative work to new mentees. This work may be openly assigned, or it may occur in stealth. This teaches the mentees how to build autonomy, and it also passes down the "contrarian DNA" which is often inherent in any intrapreneur. Employees at large corporations typically have several "intrapreneurs" that have successfully learned how to navigate their great ideas through the corporate maze and deliver great value to customers and corporate employees alike. These experienced intrapreneurs have a solid grasp of the corporate portfolio, an intuitive understanding of industry directions, strong connectivity to the customers that consume their products and services, and a remarkable ability to influence their peers in the corporate hierarchy. They can typically be individual contributors (as opposed to managers). They are limited in the number of resources that they directly own (whether it be equipment or people) because they are not line managers or management executives. The limitation of people/resources to help deliver the intrapreneur's inventions is a familiar theme that discourages many an aspiring intrapreneur. Intrapreneurs can accelerate the advancement of their ideas by using a mentoring strategy (with a twist!). Any new hire that joins a large corporation is rolling the dice when it comes to being placed underneath a manager that has a "lot of time" to hold the employee's hand and make them "the best employee they can be". The critical beginning stages of an employee's career (especially a recent college graduate) go a long way towards stimulating employee passion (as well as productivity). At best a line manager may assign a "peer mentor" to cover up their lack of time. Unfortunately these peer mentors are usually swamped themselves. Intrapreneurs, however, are the masters of time management. Their calendars are somehow filled with time to think, reflect, and collaborate. Their offer to mentor incoming employees is met with gratitude, because the intrapreneur is typically a respected member of the organization with a lot of wisdom to offer a new hire. And so the wisdom is offered. Regular one-on-one meetings are scheduled. Training courses are recommended. Customer visits may occur. Work/life balance discussions are held. An atmosphere of trust builds. Most importantly, the intrapreneur begins to share all of those "cool ideas" that are bouncing around their heads. Eventually, when the mentee expresses a passion or interest for a particular new idea, the intrapreneur casually asks: "would you like to help"? The inevitable response is "Yes! " Then the intrapreneur lays down the one condition: you have to get your work done. The intrapreneur then helps them to get their work done more effectively by leveraging their years of wisdom navigating the corporate framework. Win 1. The line manager watches their new employee thrive and excel under the mentoring of the intrapreneur. Corporate goals are met. Win 2. The intrapreneur receives a time-slice and a pair of hands that often has access to equipment (or perhaps other interested co-workers!). Idea advancement accelerates faster than the intrapreneur could do it by him/her-self. Win 3. The new employee learns the tricks of the intrapreneurial trade, effectively hitting their corporate goals under the guidance of the intrapreneur, and a new generation of intrapreneurs-in-training begins to arise. The Intrapreneur stresses the corporate tenet of productivity and trains the new employee on how to work effectively. 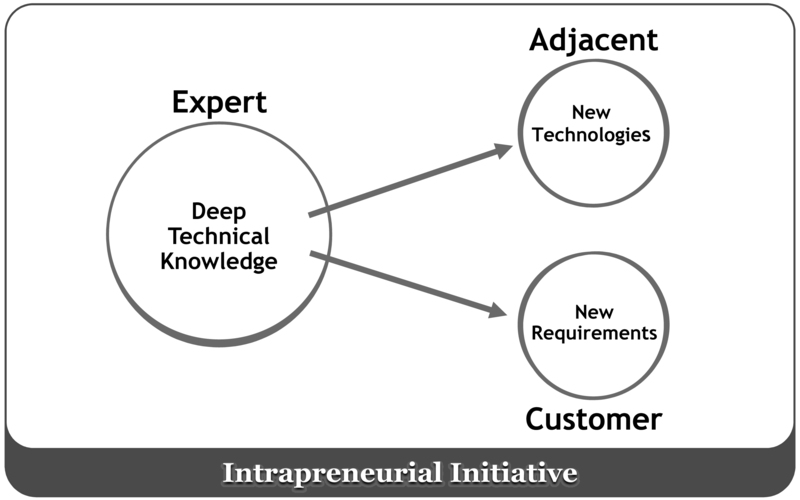 The Intrapreneur encourages the one habit that distinguished innovators from most other corporate employees: initiative. 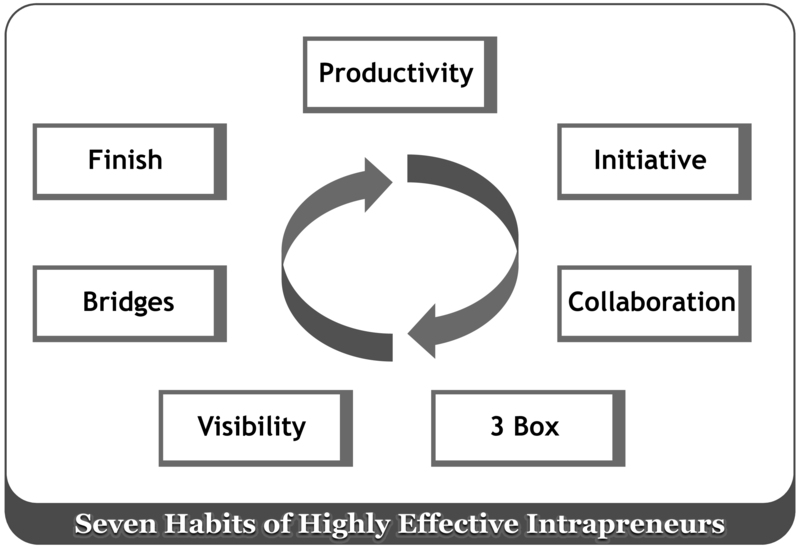 The Intrapreneur describes the third habit, collaboration, and reveals how the combination of these first three habits stimulates idea generation. The Intrapreneur helps the new employee find the right balance between corporate work and innovation by educating them on a technique such as 3-Box Time Management for Intrapreneurs. As the new employee begins to simultaneously hit corporate goals while advancing the intrapreneur's innovative agenda, the employee can be taught the importance of practicing Plus-2 Visibility. At some point the employee may have to exit stealth mode, and the Intrapreneurial Bridge Building technique can be discussed. Intrapreneurs by their very nature are finishers, and they stick with their mentee all the way to the end. The credit for this management hack actually arises out of a decision by members of EMC's Human Resources department to create a 27-month rotational program amongst EMC's engineering new hires. These new hires report to a "line manager" for 9 months at a time, but over the course of the 27-months they report (on paper) to the same mentor that helps them to navigate the beginning stages of their career. The 27 month rotational program also includes the achievement of three levels of certification in the high-tech industry, the completion of multiple "soft skill" courses, and a dedicated innovation project which assists each new employee in their understanding of how to deliver their ideas to market. By the time the 27-month rotational program has completed, the employees should have a solid grasp of the technology in our industry, the personal skills to navigate relationships, and the intrapreneurial understanding of how to progress their ideas for the rest of their careers. Also, Gary Hamel's suggestion for an improvement to Google's 20% employee grant (see "Materials" section below) was very welcome. His thoughts on a Commando Mentoring marketplace (described in the attached document) were also helpful. Steve I love this hack! I have one question - what happens if you ignite a passion in the mentee that is not the focus of the mentor? How do you keep the person being mentored on task without extinguishing their personal passion? Good question Gina. In my case I'm connected to a worldwide network of intrapreneurs (e.g. EMC Distinguished Engineers and Fellows) that I can leverage. These intrapreneurs are equally interested in hijacking the talents of a passionate innovator at the beginning of their career. If I don't have the focus and knowledge in a particular area, I can reach out to my own network and attempt to set up a separate mentoring relationship that is more effective. If that fails, I can try and leverage the world-wide EMC innovation network to perhaps find University Research in the mentee's area of passion. Joy - thanks for the note! Your hack is very clever, and the title is too! Great Hack, Steve, thanks for sharing it. This concept seems like a great response to the classic dilemma of the line manager-subordinate relationship: the focus is all on current-period deliverables and with the best of intentions, broader ambitions keep slipping down the priority order. 1. By applying some simple form of web-enabled market-making between willing mentors and mentees - has EMC gone this far? 2. By extending the program to adjacent situations where such mentoring might help, e.g., breakthrough innovation teams looking for guidance from a seasoned coach less threatened by a radical idea than the line 'establishment'. Again, is this an option you've discussed? Thanks again - love the concept. 1. We've started web-enabled interaction via our corporate social media backbone (EMC ONE) with a special community between mentors/mentees, but it is not yet a market (although several employees have indicated that they wish they could participate in something similar). 2. Similarly, all ten mentees are being put through an innovation exercise on EMC ONE (in full view of the rest of the company). Again, it is not quite a market for breakthrough innovation teams, but it displays the value that you are talking about.